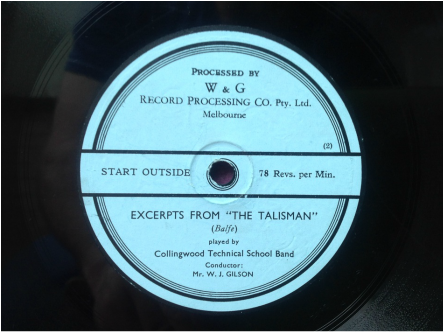 Official School records contain very little information about the first school band, but certainly one existed during the period from February 1938 to December 1947, i.e. during the time that Mr. W. J. Gilson was teaching at the school. In a letter to the Education Department on 17th May, 1940, Stang wrote in part: He (Gilson) is teaching 30 periods in the junior technical school and two hours on one evening in the senior technical evening school, which together makes the equivalent of 34 teaching periods. In addition, he spends six periods each week instructing the school band. In early 1945, he wrote to Gilson: The excellent results of your continued assiduous work in training and conducting the school band was the subject of very favourable comment at the December meeting of the School Council, and I was requested to convey to you an expression of the warm appreciation of music by the students of this school. The band has had an uplifting effect on the morale and tone of this school, and is greatly appreciated by all of us. It must also be a source of similar satisfaction to you. 78 r.p.m Walter and Keith Capper." Walter and Keith Capper were two of the original band members that performed on the record. 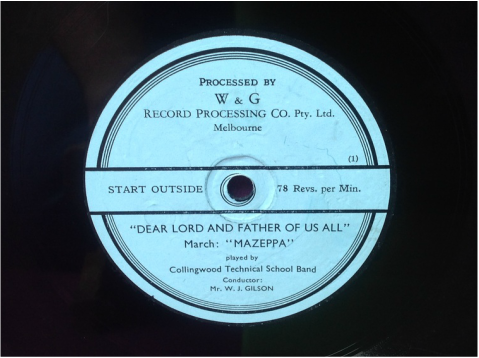 The band, consisting of 30 members, recorded their performance at W & G's, 185 A'Beckett Street, Melbourne. Walter, who was 12 years old when he came to Collingwood Technical School, attended between 1941 and 1944. Walter played the cornet while Keith, his older brother of 2 years, played the tenor horn. Walter mentioned that the band marched up and down Smith and Johnson Streets during lunchtimes, 3 times a week for the purpose of raising money for the war effort. It would appear the band went into recess when Gilson resigned from the teaching service at the end of 1947 and was not revived until November 1963 when Mr Ivan Holmes, the school's music teacher, advised the Parent's Club that he would like to see a school band formed. He received such enthusiastic support from the club, the Principal (Mr J Barberis), and the School Council that within twelve months, a band had been formed and several instruments purchased. In addition, the Army had presented the school with a mace and a bass drum. Mr William Shea, who had been with the Collingwood City Band since his early teen years, and by this time was bandmaster of that band, was engaged as school bandmaster. At the same time, he was teaching bands at Hyde Street Primary school, Footscray, and at Footscray Technical School. Mr Shea's Son, Kevin, joined his father on the staff in Term 2, 1968, making it possible to have two sections; 'The School Band' and 'The Training Band'. By 1973, the band was fully equipped with uniforms and was performing with success in competitions; winning the State championship on two occasions, whilst individual students were successfully competing as soloists. The band was also in considerable demand for public performances, such as Anzac Day parades and Education Week displays, and was honoured to play at youth gatherings in the grounds of Government House. Age forced Bill Shea's retirement in December 1978, but Kevin Shea continued until the closure of the school.